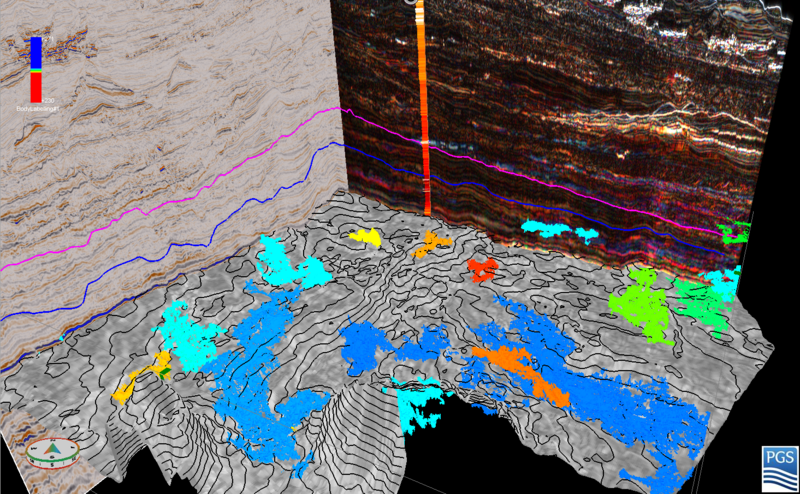 For quick and confident analysis of large seismic volumes, GeoTeric combines our AVO blending, geobody segmentation and a specialised common risk segment framework to see more geological features in your seismic data. This allows you to confidently evaluate your geology, conducting prospect identification to take your operations forward positively. In this study, we use a broadband PSDM data set (BM-SEAL-4-10-11 Geostreamer 3D, courtesy of PGS) to calculate attributes that reveal elements of the total petroleum system in the Sergipe-Alagoas Basin, offshore Brazil. We use a multi-attribute approach which includes combined structural/edge attributes to reveal potential trapping mechanisms and hydrocarbon migration pathways as well as frequency decomposition and AVO to reveal the source, seal, and reservoir. Utilizing our Interactive Facies Classification Tool along with color blending and multi-attribute visualization, we then build a volumetric “Common Risk Segment” representation of revealed prospects. This approach allows us to rapidly reveal prospects which can be risk-ranked using a composite common risk segment framework. None of these time zones work for you?